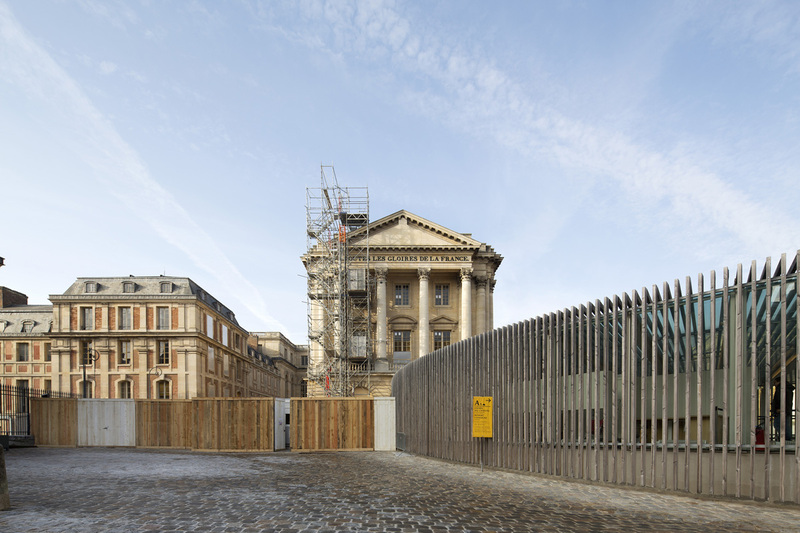 "The project for the refurbishment of the Dufour Pavilion in the Palace of Versailles, a blending of restoration, rehabilitation and contemporary intervention, was launched almost immediately at the conclusion of the 2011 architecture competition, with our proposal having been selected as the laureate. 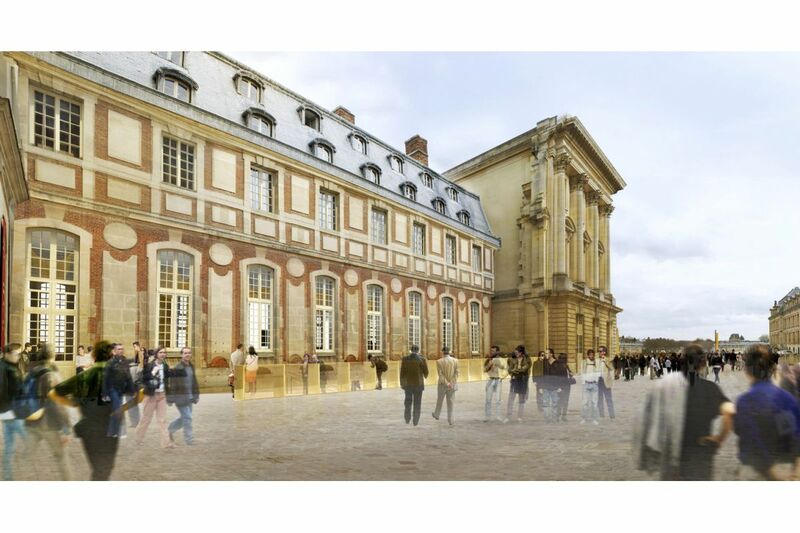 Its conception is closely aligned with the master plan inaugurated in 2003, of which one of the aims was to construct new spaces inside the palace. 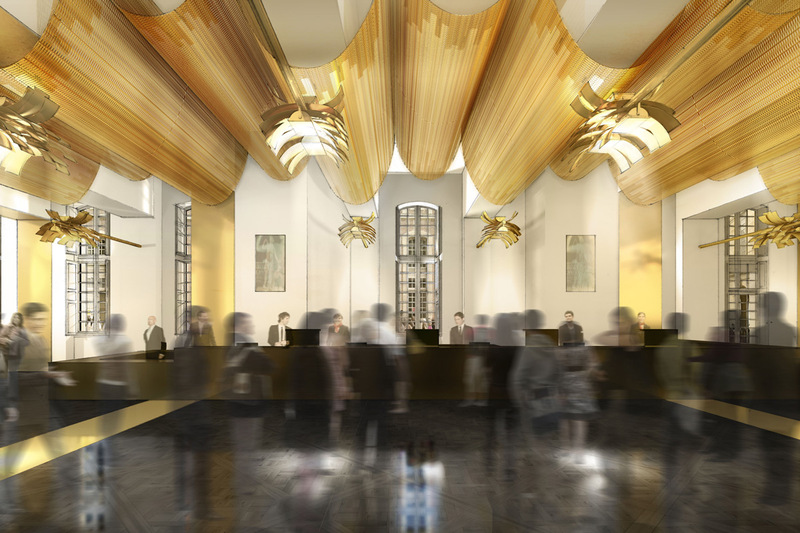 Carefully complying with the requirements set forth by the client, the project involves the creation of a new reception area for the approximately five million individual visitors the palace welcomes annually. A large café and an auditorium are another addition to this facility, which is intended as the point of entry for visitors as well as their final stop before leaving the palace. In developing our proposal, we sensed that the function of reception offered an opportunity to create a genuine introduction to the tour of the palace. Our approach, which, without compromising in the slightest on the functional requirements, nor damaging in any way the extraordinary heritage value of the context, is to erect a milestone and a bearing point for visitors standing on their path through the site, and in the chronology of its various parts, which are in fact characterized by their permanently unfinished status. 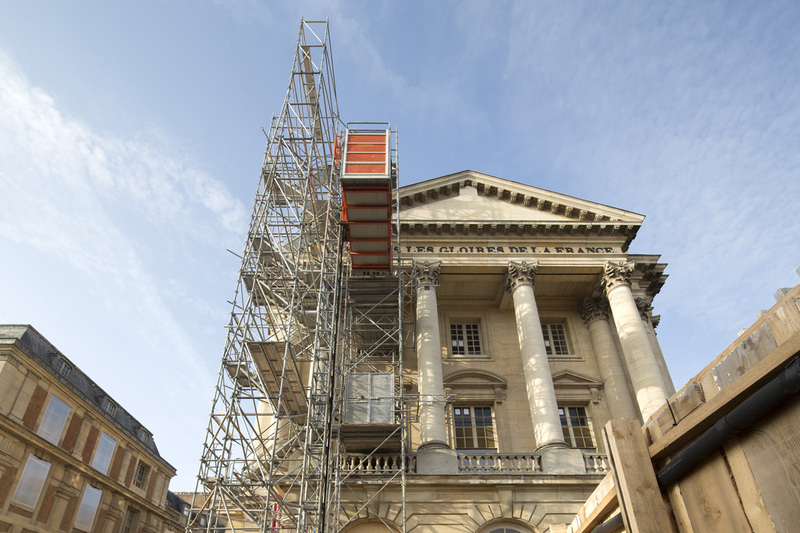 The building of the Dufour Pavilion, a decision taken by Louis-Philippe in the early 19th century, served to restore balance to the overall composition of the palace and the façade facing the town by creating a symmetrical counterpoint to the Gabriel Pavilion. 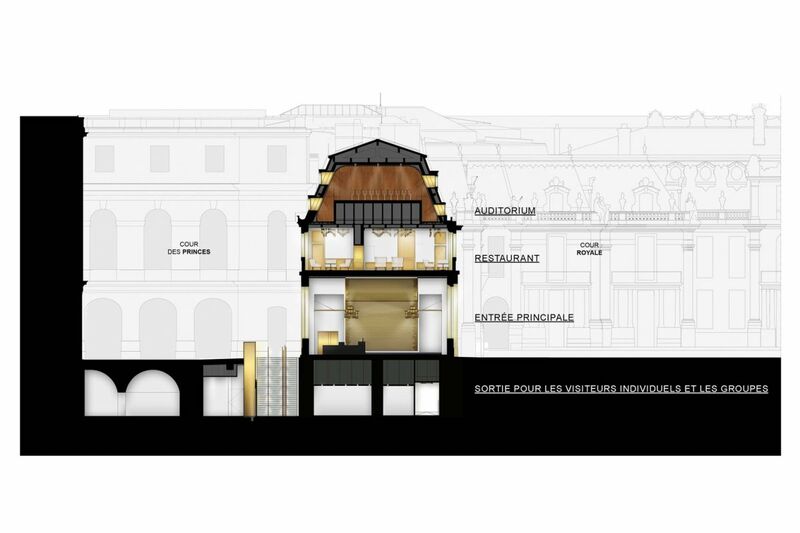 Its primary purpose was to provide a point of direct access to the royal apartments, in a harmonious aesthetic approach to the whole. However, for many years the pavilion was also allocated to various related uses, and in particular the requirements of palace administration. 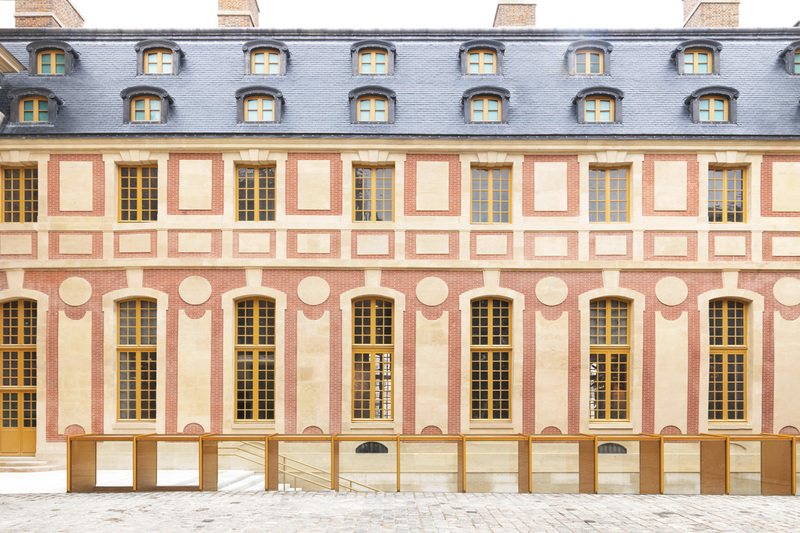 Beyond this pavilion, in its entirety, stands the Old Wing, an extension of the palace built by Louis XIII, which has been reintegrated into the tour of the site. 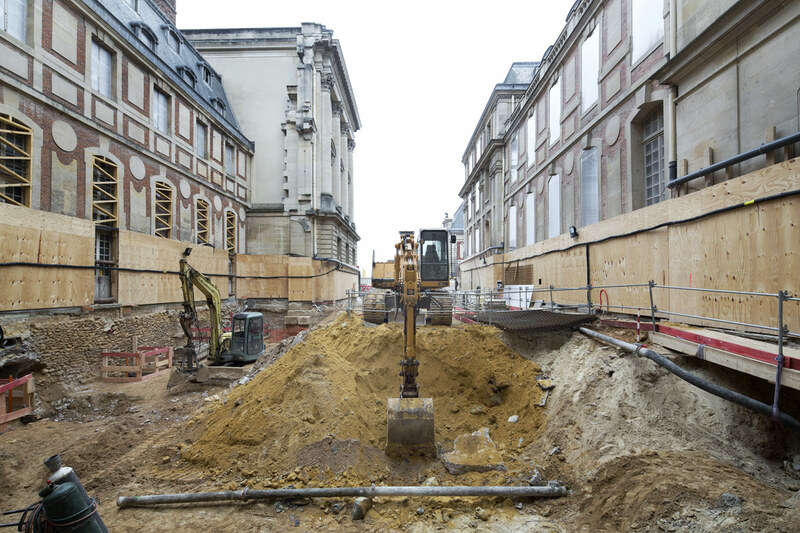 In addition, the work carried out in close collaboration with Frédéric Didier, chief architect of Historical Monuments, brought to light several areas that had been abandoned, such as the exedras in the council room, and the underground cisterns serving the kitchens. 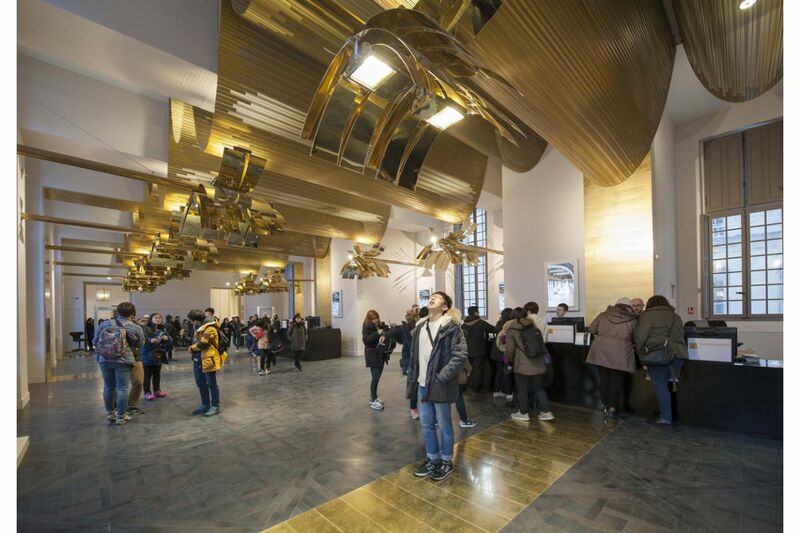 The latter with their singular volumes, have been fully integrated into the renovated site, while the former are simply echoed in the bands made of brass which punctuate the public reception area. 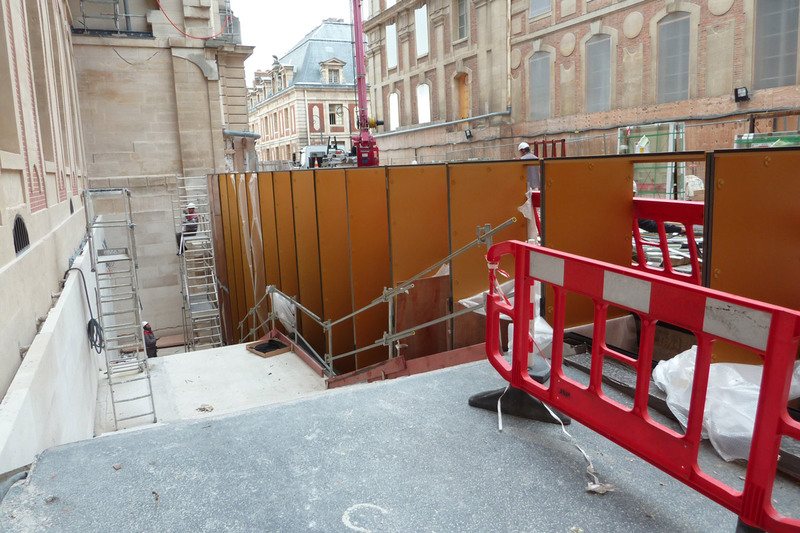 ̶	Another level, on an even plane with the palace gardens and the Royal courtyard. Visitors access the pavilion on this second level; the front-facing entry guides them to a portico, which leads to a vast, richly decorated reception gallery. 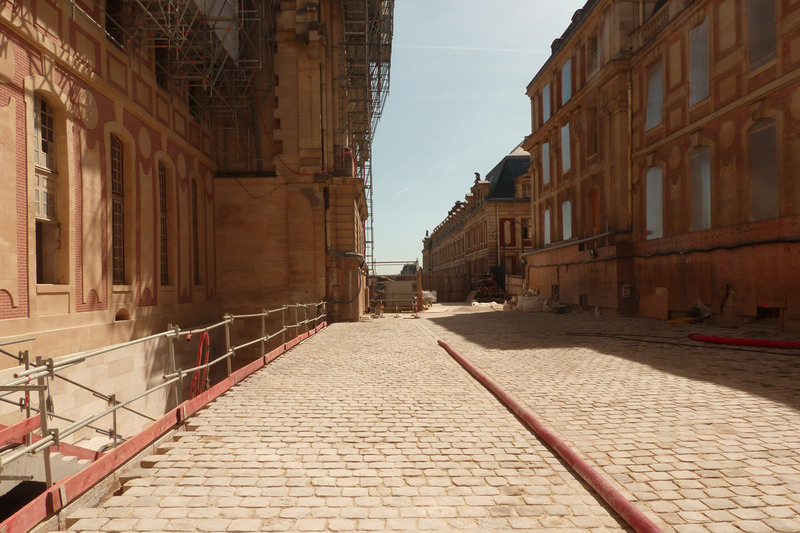 Here, on the left, the gallery opens onto the courtyard of the Princes, and on the right, onto the Royal courtyard, where the tour continues. 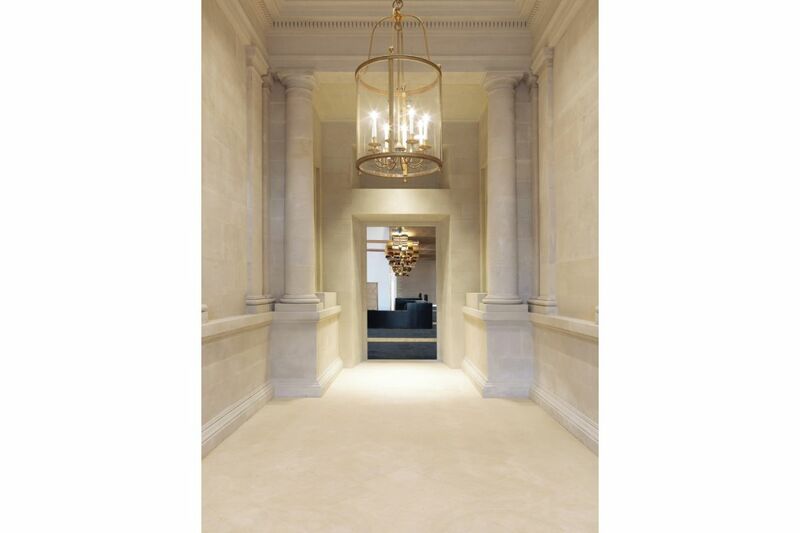 The back of this vast room opens onto a staircase linking ground floor, garden level and first floor. 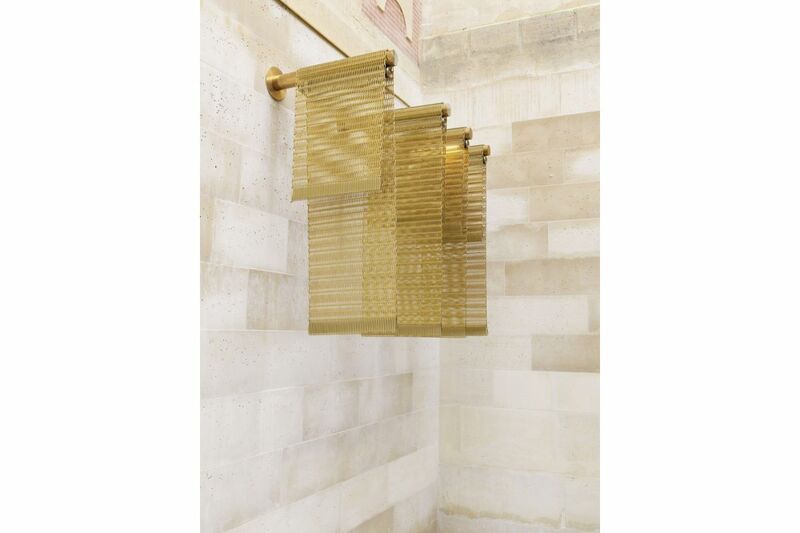 Its design, reminiscent of the sumptuous abodes of the 17th and 18th centuries, firmly places it within the classical tradition of the gradation of spaces, made evident in the treatment of the materials and ornament. The final segment of the visit ends in the Gallery of Battles, in the South Wing. 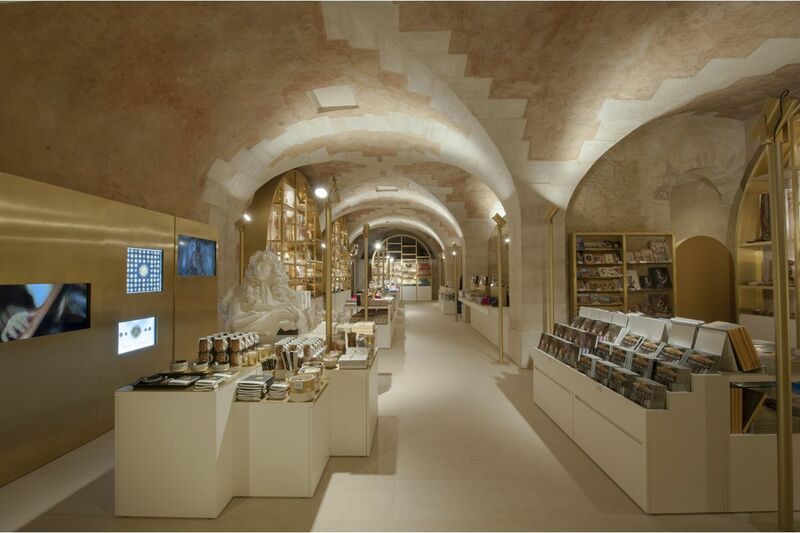 From here, visitors return to the Dufour pavilion on the ground floor, via the broad open spaces of the former cisterns, now transformed into a museum shop, and offering other services too. 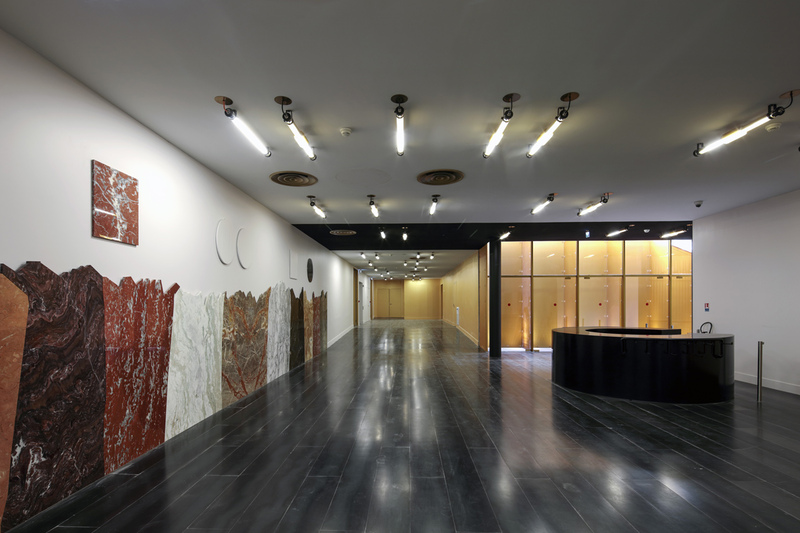 A piece by artist Claude Rutault is displayed on one of the walls of this space. 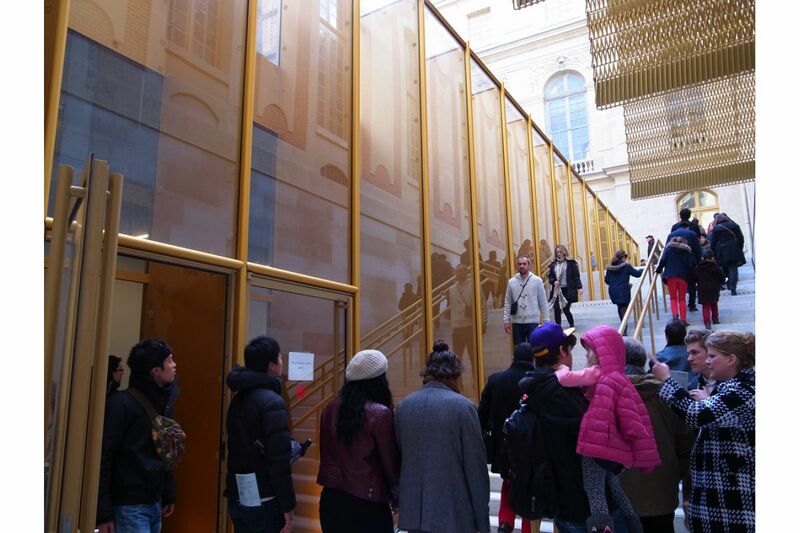 Here the tour of the palace comes to an end, with the visitors exiting via a spacious marble staircase, precisely following the façade of the Old Wing. 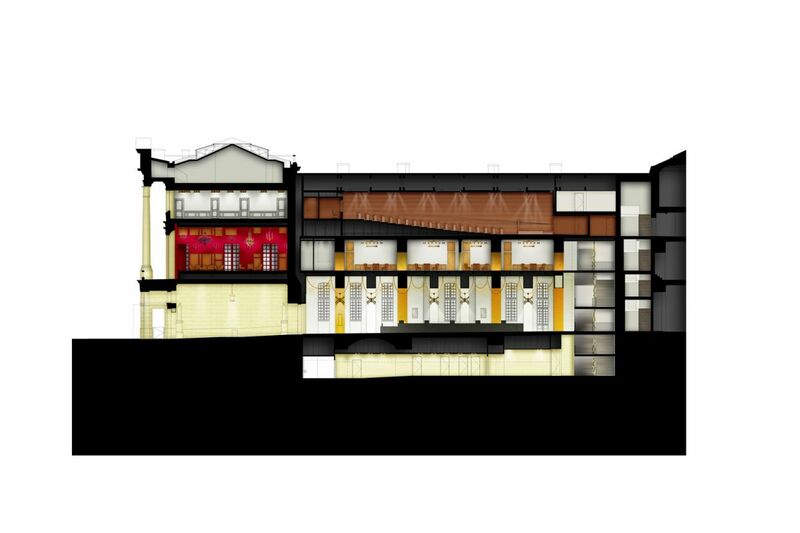 The restaurant and auditorium, easily accessible from the outside, are located on the upper floors of the pavilion, the former occupying the first floor, and the latter nestled under the rafters. The whole forms a genuine system − one could even call it a network − where the easily grasped reorganization of the interior and its streamlined interfaces facilitate and humanize the processing of voluminous flows. 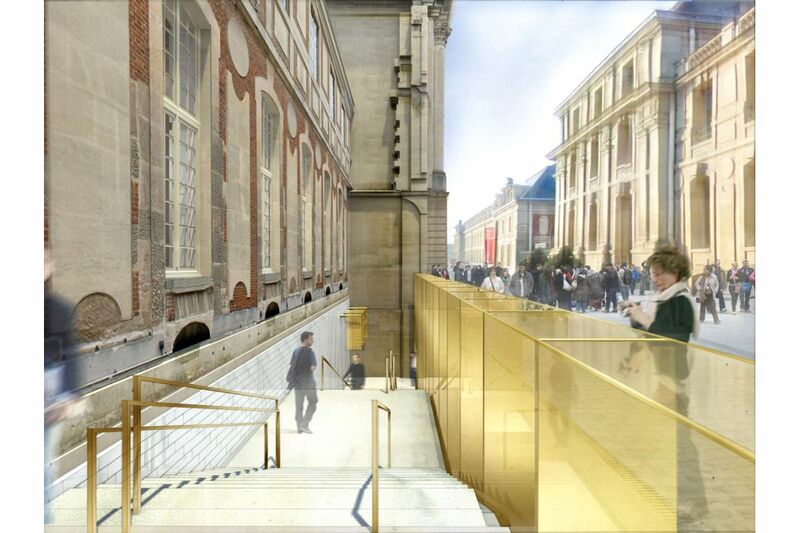 The autonomy of spaces is strengthened, without eliminating direct access to some of the most strategic areas of the palace (Royal courtyard, courtyard of the Princes, and South Wing). This new organization greatly increases the range of possible uses, notably for diverse private functions and events. The repurposing of spaces and of their interconnections is further enhanced by the subtle treatment of the interiors, with a focus on three key areas: floor, ceiling, and chandeliers. 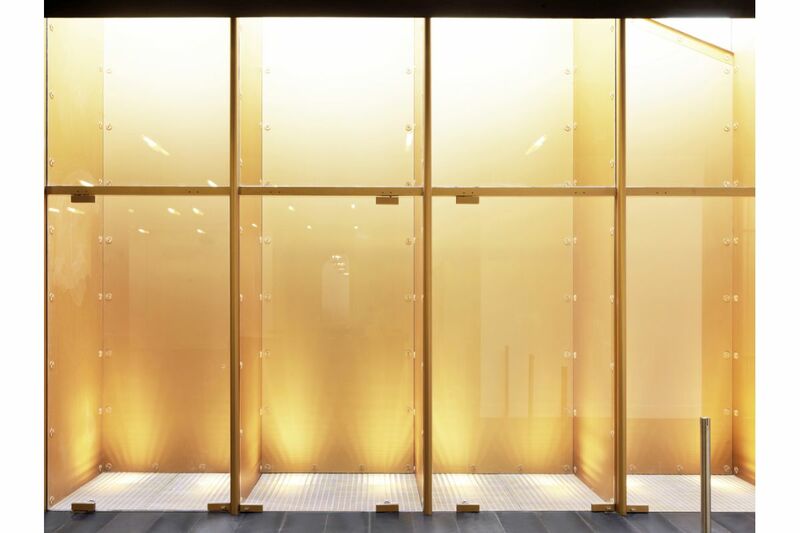 Metal, the main material utilized, pulls the project into a coherent whole, while highlighting the contemporary character and strengthening the visibility of the intervention. Parquet with metal slats covers the floors, in places repeating the renowned “Versailles” pattern. 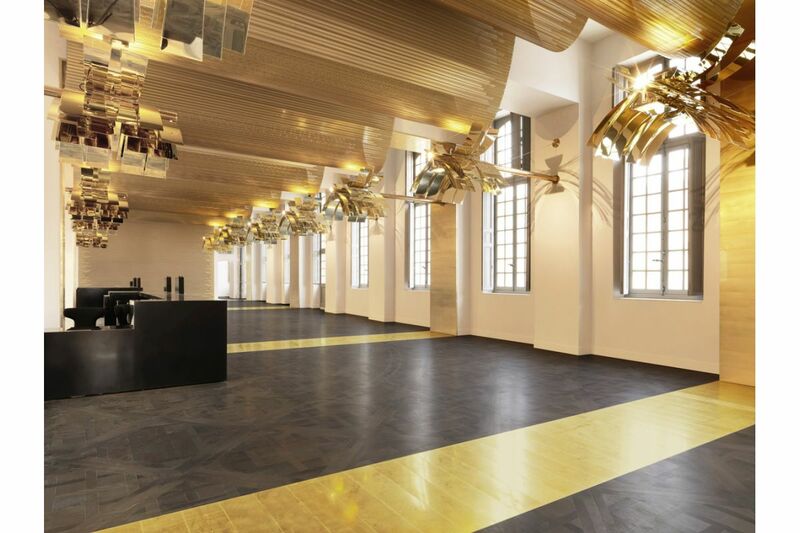 Punctuating this space are the light fixtures, like the ones in the form of standards for example, affixed between the windows of the reception gallery; their curves and reverse curves in harmonious dialog with the broad gadroons formed by the covering hanging from the ceiling, with the interior all in amber or flamboyant tones. 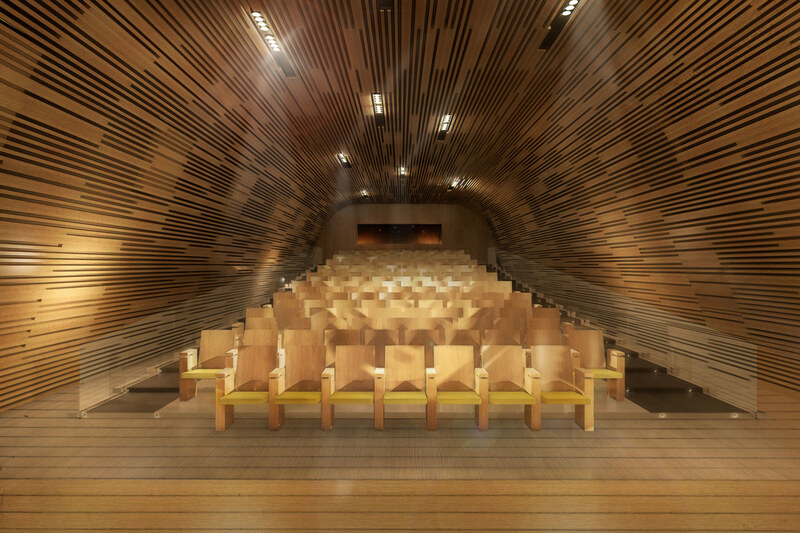 The auditorium is clad in wood. Echoing the gilded formal wrought-iron entrance to the palace forecourt and the recently restored gilded lead roof ornaments, decorations and furnishings designed for the site blend a range of materials into a sort of flavescent cameo, while reflections from the mesh and the floor cast a satin appearance on them. 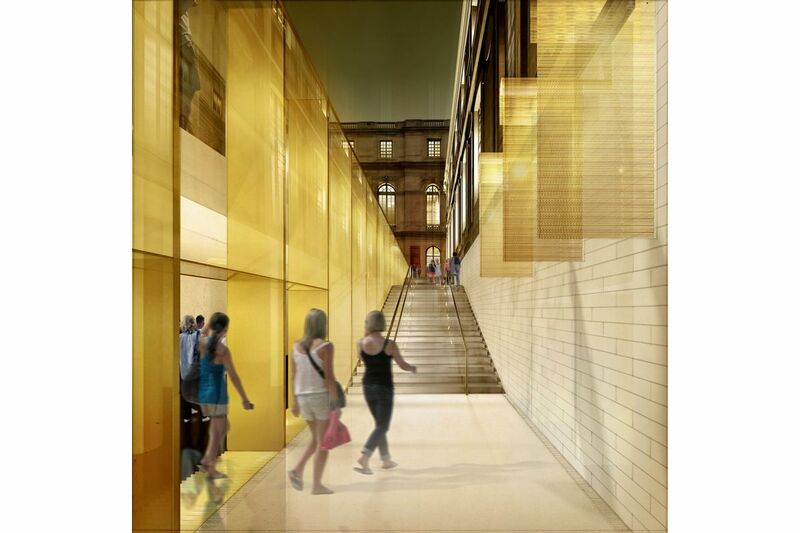 In the court of the Princes, the emergence of a pure glass prism signals the location of this contemporary intervention. 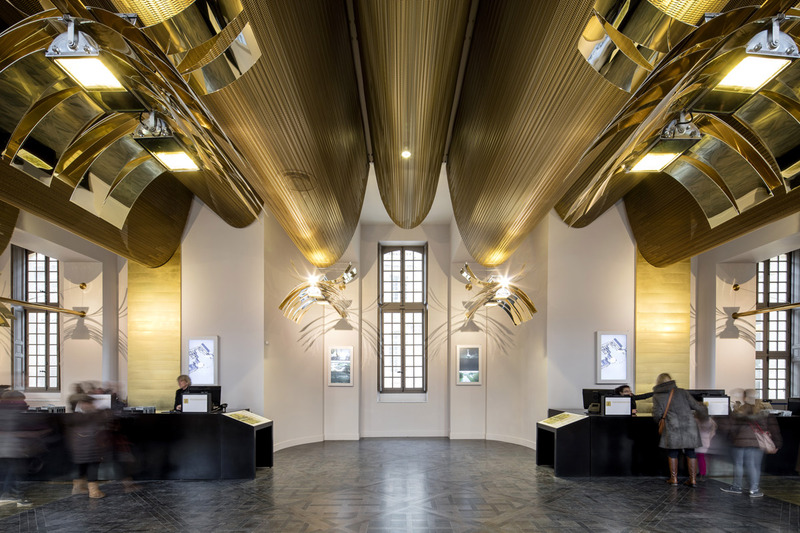 In a reference to the famous parabolic reflector designed as an experiment for Louis XIV, the wall running alongside the staircase leading to the exit is composed of a collection of large gilded metal blades, which serve to reflect natural light into the ground floor areas. A discreet evocation of the sun king's emblem, the disk-shaped washers with radial grooves that cover the screws holding these blades in place are among the subtle elements we utilized in the contextualization of our intervention. This willful use of references is not a series of isolated elements in our work. 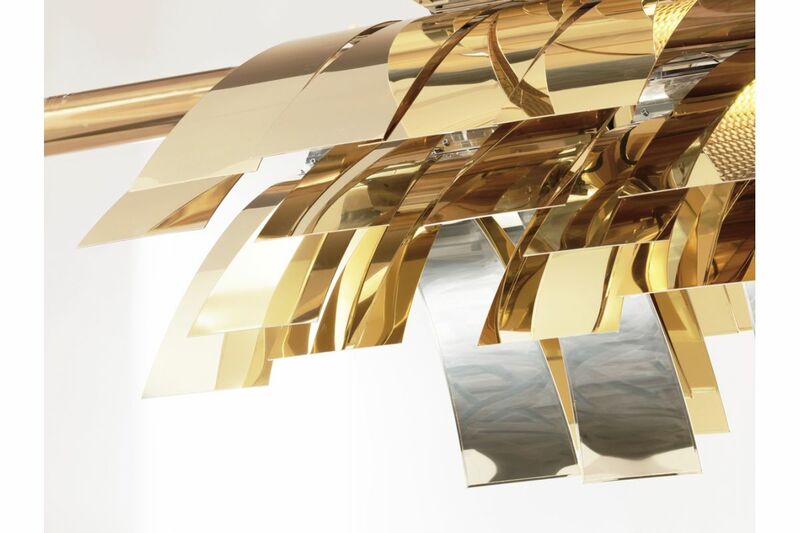 The abundant iconography of the palace provided us with a privileged source of inspiration for the design of the interiors, and notably for the luminaires. In fact, we seized upon a whole set of figures and motifs, which we have interpreted, and abstracted, to create a highly specific and contemporary decorative vocabulary, while mindfully seeking to avoid the trap of easy and immediate imitation. 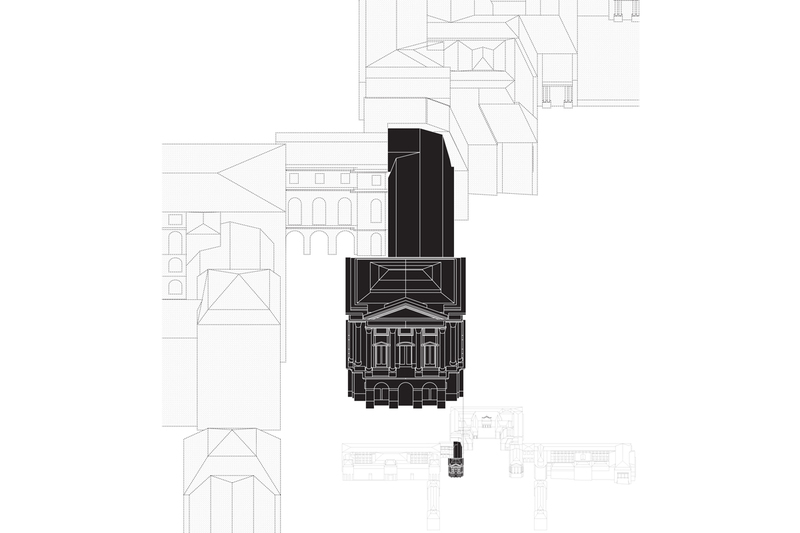 Even with the ground, the underlying footprint of the project deeply roots the reorganization of the Dufour pavilion in the geography of the estate, and the skillful use made of variations in height mark off the beginning and the end of the visit, thereby facilitating the visitors’ overall grasp of the spaces of the site. 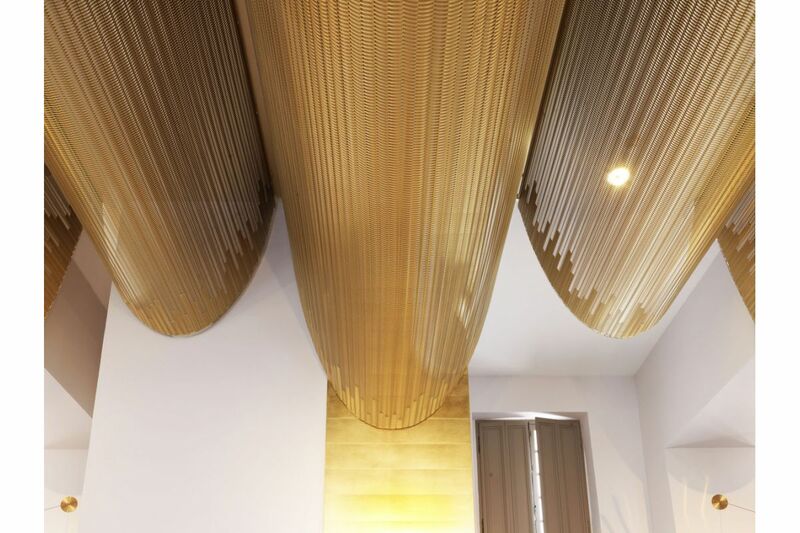 Our effort to anchor the project in the site is also aesthetic in its aim, as it enables us to adopt its materiality, decorative vocabulary and range of hues in the designs of interior layouts and furnishings. 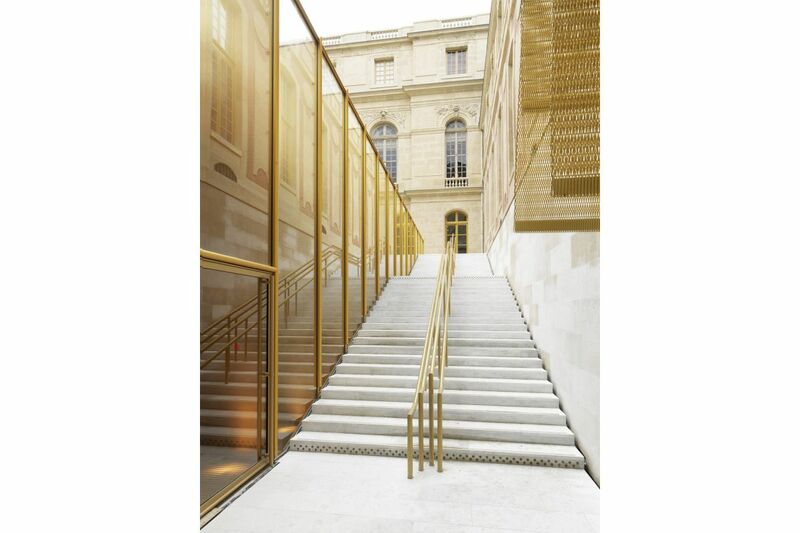 Thus, the subtle interplay of interior and exterior, by blending in with the overarching scheme organizing the palace, merely serves to better reveal and transfigure this exceptional heritage site." 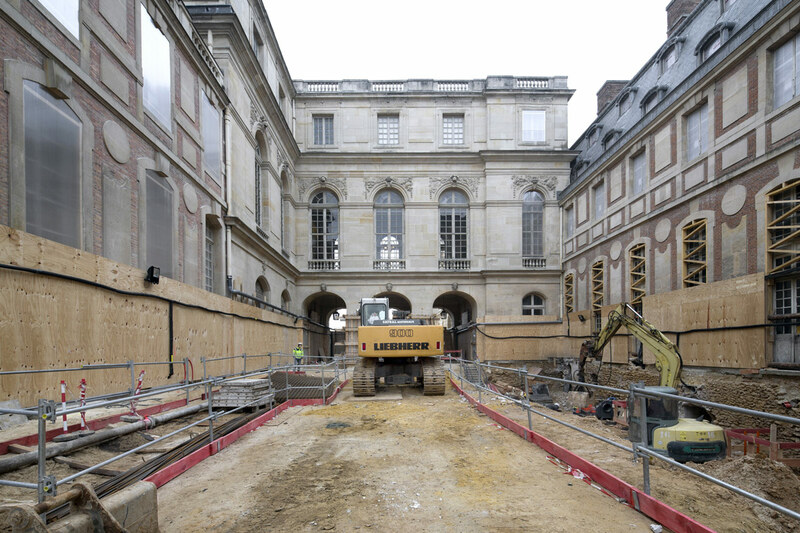 • civil engineering: Khephren Ingénierie S.A.
Redevelopment of the Pavillon Dufour and creation of the main entrance for individual visitors, in close collaboration with Frédéric Didier, Chief Architect of Historical Monuments of the Château de Versailles. 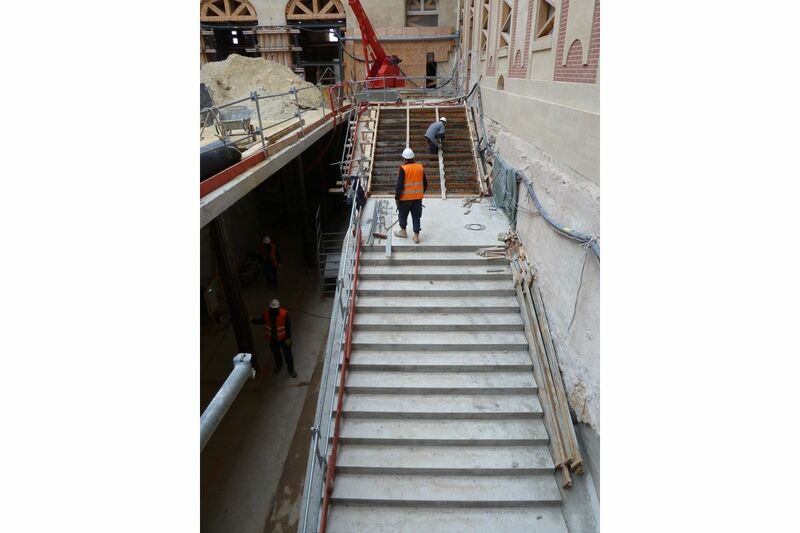 Garden level: entrance and reception of individual visitors, information and starting point of the visit of the Palace for thousands of individual visitors per day. Ground floor: Réunion des Musées Nationaux shop in the former cisterns, including interior and furniture design, bathrooms, cloakrooms, restaurant kitchens built in the new underground areas, and exit stairs for all visitors - individual and groups (7,5 millions per year in total). 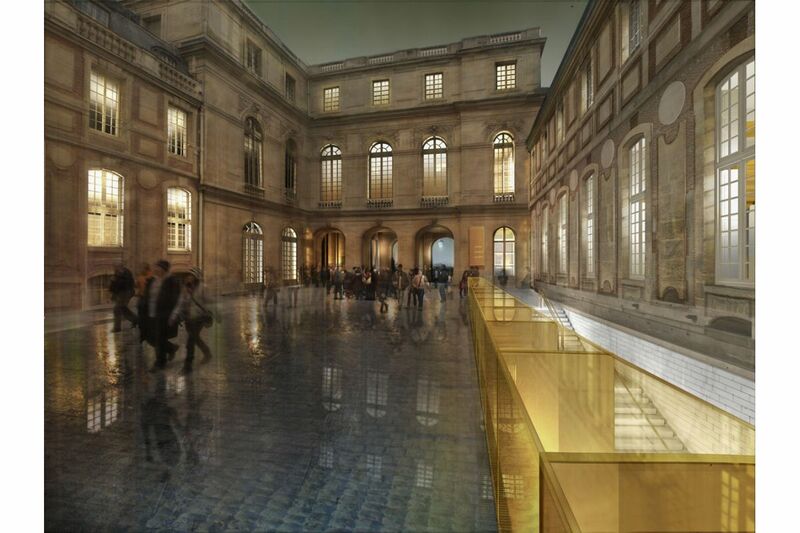 Second floor: Alain Ducasse’s restaurant (120 covers) including interior design, furniture design, services areas and landmark Salons looking down on the Royal Courtyard. 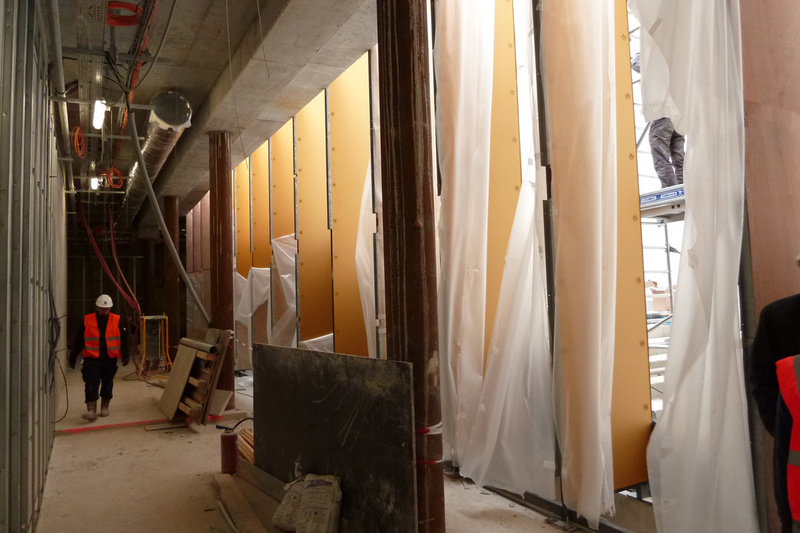 Third floor: auditorium (150 seats), technical room, interpreters’ rooms and meeting rooms.